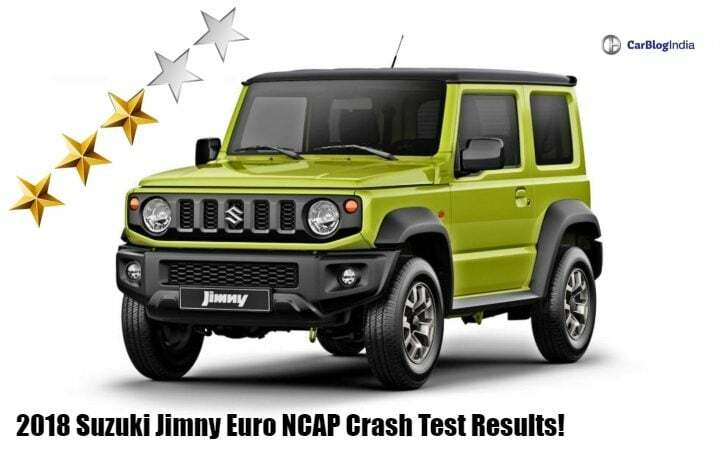 The 2018 Suzuki Jimny has scored 3 stars in the recently conducted crash tests by Euro NCAP. The report states driver side airbag failed to inflate properly. Euro NCAP has recently conducted its detailed crash test on the 2018 Suzuki Jimny compact off-roader. Currently, on sale in the Japanese as well as the European markets, the latest iteration of the Jimny has scored 3 stars in the aforementioned crash test. According to the report, the 2018 Suzuki Jimny scored 73 per cent in front adult occupant protection. While it scored 83 per cent in child occupant protection. In addition to this, its safety systems ranked at 50 per cent. On the other hand, it scored 52 per cent in term of pedestrian protection. As a result of this, the Jimny managed to score only 3 stars in these Euro NCAP crash tests. The reason, as explained in the report filed by this independent governing body is that the driver’s side airbags failed to inflate properly. As a result of this, it was not able to cushion the driver’s head properly when coming in contact with the steering wheel. Another reason which contributed in Suzuki Jimny to score just 3 stars is that the A-pillars, in the frontal offset impact, showed signs of deformity. Hence, giving the compact SUV a low score in terms of driver torso protection. Not only this, the front seats of the 2018 Suzuki Jimny did not offer adequate whiplash protection in the case of a rear impact. Another area where the Jimny scored less was the safety of the vulnerable road user’s protection. This is due to the fact that this compact SUV has a very stiff windscreen. Talking about the Suzuki Jimny, this mini off-roader is currently running in its fourth generation. And as mentioned before, is currently on sale in the European and Japanese markets. Earlier there were speculations about Maruti bringing in the Jimny to India to replace the ageing Gypsy. However, lack of demand in the lifestyle SUV segment made the Indo-Japanese automaker drop its plans to do so. In the international markets, the Jimny comes with a 1.5-litre petrol engine. This gasoline-fueled motor belts out a total of 102 BHP of power along with 130 NM of peak torque. The motor is paired to a 5-speed manual gearbox as standard. However, there is a 4-speed torque converter unit on offer as well. If launched in India, the 2018 Suzuki Jimny will sport a price tag of INR 7.5 lakh to 10.5 lakhs. This will put it right against Maruti’s own Vitara Brezza. The latter has been leading the charge in the sub-compact SUV segment.